Set sail with the inaugural World Ocean Festival on Sunday, June 4 at 12 noon with Classic Harbor Line aboard Schooner America 2.0 or Schooner Adirondack. The World Ocean Festival is a kick off to The Ocean Conference spear-headed by the UN from June 5-9. This newly established annual conference supports the United Nations’ Sustainable Development Goal 14, which addresses the conservation and sustainability of the world’s oceans. 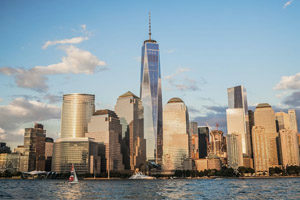 The Festival includes the flotilla in New York Harbor, plus day long activities at the World Ocean Festival Village at Gantry Park in Long Island City. Themes addressed in the conference include climate change, fisheries, pollution and rising waters. Be part of ‘march’ on the water by setting sail with Classic Harbor Line. Schooner Adirondack & Schooner America 2.0 will do the first half of the 10-mile flotilla leg (Pier 64 to the Battery), then sail to the Statue of Liberty and back to Chelsea Piers (12:00pm – 2:00pm). A ticket aboard Adirondack is $52 and includes complimentary beverages. Guests are welcome to bring their own picnic on this sail. A ticket aboard America 2.0 is $108 and includes a gourmet brunch spread plus complimentary beverages. Schooner America 2.0 is the innovative, eco-friendly hybrid sailing yacht created by Scarano Boat Building. The ‘2.0’ aspect of her construction refers to her cutting-edge construction materials and her propulsion system. In her ‘engine room’ there is a large battery bank system providing electric propulsion. Peel away her hull and rather than finding heavy fiberglass or steel, there is an extremely light and durable 3-layered composite: a sandwich of cedar over balsa core, laminated with an epoxy resin. Rather than a heavy wooden rig aloft, one finds carbon-fiber masts, booms and gaffs. Together, these strengthening and lightening components of construction, coupled with her modernized power-sourcing, America 2.0 is provided with the ability to move through the water more effortlessly, efficiently and with minimal environmental impact. Guests aboard either schooner will experience spanning views of Manhattan’s financial district, the One World Trade building, Ellis Island and Governor’s Island, as we sail into New York Harbor for an up close viewing and photo opportunity in front of the Statue of Liberty. Sit back and relax as you take in the sights and enjoy the ambiance of the march! 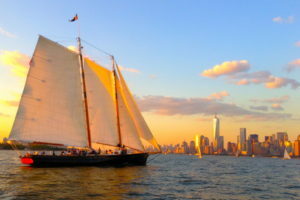 Buy tickets here: Day Sail to Statue of Liberty on Adirondack, or Brunch Aboard Schooner America 2.0. There will be many photo opportunities throughout this sailing experience. We encourage guests to find Classic Harbor Line on social media and tag us in your photos! Located in Manhattan’s prime Chelsea neighborhood at the Chelsea Piers Complex, CHL offers top shelf specialty tours and foodie cruises. Locals appreciate the quality of a CHL boating experience, and tourists “in the know” are aware that Classic Harbor Line is the go-to for an authentic boating trip whether it be a 2-hour sail to the Statue of Liberty, a brunch cruise, or a private charter for a celebration; Guests numbers are kept well below capacity while the food and beverage quality and service is kept very high. NYC Architecture update from the water! Join Classic Harbor Line & AIANY for a Boat Tour with rare views of the city’s waterfront mega-projects. 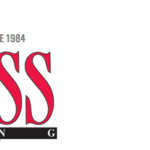 Learn how active infrastructure and perimeter highways are capped and built over to create ambitious mixed-use developments. Members of AIANY’s guide team, including practicing architects, offer insights on architecture, urban planning, and the city’s history throughout the full circumnavigation of Manhattan. The West Side’s Hudson Yards, currently under construction atop an immense platform over active rail yards, is the region’s largest private development. Office and residential spires, public space, and plenty of retail will coexist with some of the city’s newest cultural destinations. 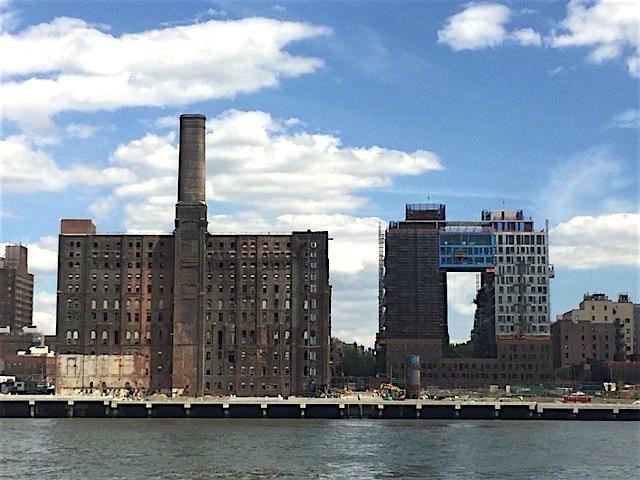 Brooklyn’s 1884 Domino sugar plant site is undergoing transformation into the centerpiece of a work-live neighborhood on a scale unknown to “brownstone Brooklyn”. SHoP Architects recently topped out 325 Kent, a “rectangular donut” shaped building, best-appreciated from the unique vantage point of the East River! Cornell Tech on Roosevelt Island is becoming a model for sustainable campus design. Buildings by Morphosis, WEISS/MANFREDI Architecture/Landscape/Urbanism, and Handel Architects incorporate LEED, net-zero, and passive house principles to create and limit energy use on site. Rockefeller University’s Stavros Niarchos Foundation–David Rockefeller River Campus is nearing completion along Manhattan’s East River. See up close how innovative design and engineering work by Rafael Vinoly Architects and Thornton Tomasetti extended this campus over FDR Drive. Columbia University’s Manhattanville Campus has begun to rise above Riverside Drive. The Jerome L. Greene Science Center, designed by Renzo Piano Building Workshop, is the first completed structure among others by internationally acclaimed, award-winning architects that will lead this renowned NYC institution into its fourth century. A growing menu of architecture and infrastructure tours and private charters are scheduled seven days a week to offer visitors, locals, architecture tourists, design professionals, and students detailed and up-to-date narration. Comments Off on NYC Architecture update from the water! Enjoy some afternoon NYC Memorial Day activities! Celebrate Memorial Day with us and give honor to those that have served this country. Sail with us into NY Harbor and view the Statue of Liberty and Freedom Tower from the water aboard one of our classic boats. We have many NYC Memorial Day Activities whether you are a local or visitor. Step aboard for a NYC Sightseeing Boat Tour or cruise around Manhattan for a AIANY Architecture Tour. Soak in the sun this Memorial Day by sailing the afternoon away on one of our beautiful schooners or get away for the day and cruise up to Bear Mountain. Whatever you choose you are sure to make it memorable! So grab your friends and family and pick from one of our top 5 NYC Memorial Day activities to enjoy a boat ride out into NY Harbor with our most hospitable crew. Mother’s Day is right around the corner and we have some fun activities for Mom this year! 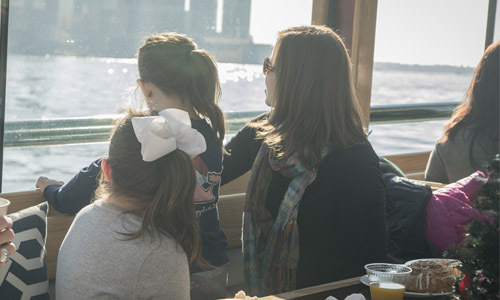 Grab Mom and join us on any of our NYC Mother’s Day Cruises! We all know that sometimes finding the perfect gift can be stressful but we also know that Moms love quality time with their loved ones and what better way to do that than on one of our classic boats in NY Harbor. Whether it be a leisurely cruise or educational cruise you are sure to find the right fit for your mom. 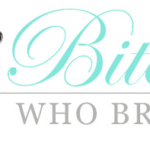 So celebrate with us and jump aboard for one of our NYC Mother’s Day Cruises in NY Harbor! Spend the morning with mom and treat her to an Around Manhattan Mother’s Day Brunch Cruise aboard the luxury yacht Manhattan II. This is the best way to treat mom and enjoy an afternoon together. Soak in the sun and take in all of the beautiful views this city has to offer. This NYC Brunch has a bountiful buffet spread includes fresh baked frittattas, glazed spiral ham, NYC’s best bagels with lox, spreads, and all the fixings to go with them. A waffle station with berries, upstate syrup and fresh cream, fruit and salad displays, and fantastic pastries and bakery! Grab Mom and step aboard our 80 foot Schooner to enjoy an afternoon of sailing in NY Harbor! Soak in the sun or watch the sun dip behind the Statue of Liberty with a cool beverage in hand and wind in your hair. Today is a day to honor Mom and create a magical memory and what better way of doing that then sailing aboard this beautiful sailboat! Grab Mom and join us for an evening on the water listening to some live Jazz music aboard the luxury yacht Manhattan II. Enjoy each other’s company and sip on Champagne and have the famous NYC skyline as your backdrop for this elegant evening. Have Mom request her favorites and cruise into the night on a classic boat with us. Celebrate Mom in style with us aboard one of these NYC Mother’s Day Cruises!